Anyone who knows a little about the automobile industry knows very well about the rivalry between blue oval and bowtie. Yes, we are talking about the rivalry between Ford and Chevrolet that gained momentum in the 1960s and continuing till now. 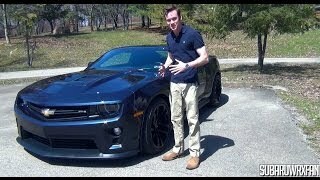 The 2012 Chevrolet Camaro ZL1 debuted at the 2011 Chicago Auto Show and it is meant to give the 2013 Ford Shelby GT500 some bit of competition. Powered by a 6.2 liter supercharged V8, the Camaro ZL1 doles out 580 HP at 6000 rpm, which is a tad bit more than the GT500. The car delivers a peak torque of 510lb-ft. 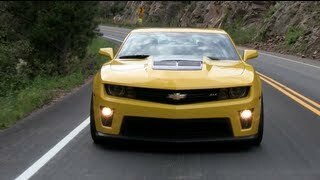 Although the ZL1 suffers from a little weight disadvantage from its Mustang counterparts, power of extra 30 horses should make it overcome that difference easily. The ZL1 comes with the latest Magnetic Ride Control developed by GM, with 1000 damping adjustments, which makes this new Camaro go faster and turn faster. This technology is also found on the Corvette ZR1 and the Cadillac CTS-v. Two transmission options are available with the ZL1 – a 6-speed automatic with manumatic control and a tremec 6-speed manual. As far as look of this car is concerned, it can be distinguished from its predecessors by a new front fascia and a hood with the signature central section. The central section has been constructed of carbon fiber composite and has been rendered a satin black finish. This section incorporates the air extractors. Apart from that the ZL1 has a larger boot lid spoiler, redesigned front bumper, four exhaust tips, and new rocker panels. Once you hop inside, you will see a sportily designed dashboard, with two main consoles. Black leather seats with Camaro ZL1 logo on the front headrests impart a feel of class to the car. The flat bottom steering wheel with central hub and spoke seems to be reminiscent of 2012 Sonic. Who will have the last word in this competition only time will tell. But production having just started, this competition between these two legends of automobile industry is sure to heat up in the days to come. But there is no doubt that interesting times lie ahead as far as Chevy Camaro and Ford Mustang dogfight is concerned. CHICAGO – The 2012 Chevrolet Camaro ZL1 debuted today at the Chicago Auto Show. It is the highest-performing Camaro and the most technically advanced car ever developed in its class. The new ZL1 continues the momentum of Camaro, propelling it into an entirely new realm of leading-edge performance technology. It is planned to launch at the beginning of 2012. Motivated by a supercharged V-8 engine producing an estimated 550 horsepower (410 kW), the Camaro ZL1 will be the fastest Camaro ever offered by Chevrolet. And more than just power, the ZL1 features technologically advanced and highly developed chassis and suspension systems that help it deliver balanced, track-ready handling and braking power to complement its high engine output. Rigorous development of the ZL1 is ongoing, and official estimates of the car’s capabilities will be released later in 2011, as testing nears completion. The ZL1 name is derived from the all-aluminum racing engine of the same name, which was developed in the late 1960s and installed into a handful of regular-production 1969 Camaros. Only 69 were built with the engine, but they’ve achieved mythical status among enthusiasts, as they represented the pinnacle in Camaro performance – until now. The 2012 ZL1 model is designed to be a major leap forward for the Camaro, bringing a new level of performance capability to the segment. The central goal of the car’s development was creating something new – a Camaro intended to reach optimal lap times on top road-racing circuits and excellent driving dynamics on the street. To achieve that goal, engineers evolved many of the existing Camaro’s systems, as well as incorporated new technologies such as electric power steering and Magnetic Ride Control, the world’s fastest-reacting suspension system. Major elements of the ZL1’s design are a new front fascia and hood with air extractors, designed in tandem to create aerodynamic downforce to aid handling. The car’s hood includes a signature center section constructed of carbon fiber and rendered in satin black finish. New rocker panels, wide tires, 20-inch wheels and exhaust tips portray the car’s handling and power. Because the Camaro ZL1 uses electric power steering, the engine does not incorporate a conventional hydraulic power steering pump on its accessory drive system. This enhances performance, because no engine power is used to turn a steering pump pulley. Transmission – The high-performance Tremec TR-6060 six-speed manual is matched with the LSA engine. It is the “MG9” version of the transmission, with a higher torque capacity. It is used with a dual-mass flywheel and twin-disc clutch for easy operation and shift smoothness. A new, shorter-throw shifter actuates the gear changes. Exhaust – ZL1 is equipped with a dual-mode exhaust system, which alters the sound level and character in response to engine rpm. First used on the legendary Corvette, and specifically tuned for Camaro ZL1, the dual-mode exhaust will give the car a signature sound. Drivetrain – It is revised with a stronger driveshaft and rear axle system, featuring a larger and stronger cast iron differential housing, stronger axles and heavy-duty limited-slip differential. This patent-pending system is designed to ensure that ZL1’s tremendous power is delivered smoothly to the ground. Suspension – The suspension features completely revised tuning and the inclusion of segment-exclusive Magnetic Ride Control. ZL1’s Magnetic Ride system will include driver selectable modes (Tour and Sport) tailored for the preferred style of driving. It uses advanced magneto-rheological science to produce shock damping with the highest level of precision, enabling body control optimized for excellent performance in everyday driving as well as track situations. This technology appears on only a small roster of some of the world’s finest performance cars. Other chassis elements are redesigned to support the car’s high-performance limits. Rear stabilizer bars have drop links repositioned outboard of the control arms. This makes the bars more effective in controlling body roll in turns, with crisp response to driver commands. Brakes and Steering – Camaro ZL1 features an advanced track-capable braking system, developed in conjunction with experts from Brembo. The large 14.6-inch (370 mm) two-piece front rotors have six-piston calipers; the 14.4-inch (365 mm) rear rotors have four-piston calipers. ZL1 marks the entry of a new electric power steering system to Camaro. It is being developed to ensure precise control and feedback to the driver, with greater variability of effort for high-performance driving. Exterior – ZL1’s signature from the front is the redesigned fascia and aluminum hood with a raised, carbon fiber insert. The fascia includes a front splitter and new vertical fog lamps. The fog lamp area includes air intakes designed for brake cooling. The hood features front-mounted air extractors that direct air precisely over the car. Visually, this center section, in satin black carbon fiber, communicates the car’s high-performance intent as a visual contrast to the car’s exterior color. Functionally, the air extractor is a key in connecting airflow closely to the bodywork, creating aerodynamic downforce. The carbon fiber center section reduces the mass of the hood. High-intensity discharge (HID) headlamps and fog lamps are standard. The rear of the car includes a diffuser and spoiler, also functional elements that enhance the car’s aerodynamics. Interior – ZL1 is tailored for high-performance driving. The front seats feature microfiber suede inserts. Other enhancements include a redesigned steering wheel, alloy pedals, Head-Up Display with unique performance readouts and the “four-pack” auxiliary gauge system featuring a boost readout.